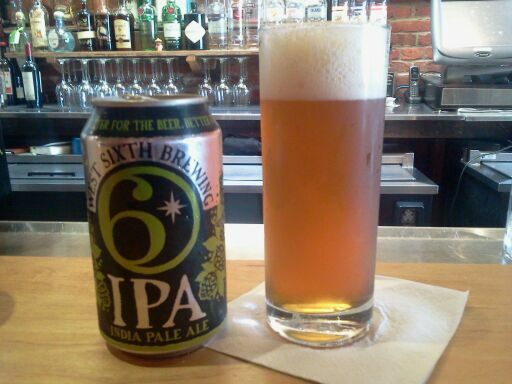 Finally wrapped my taste buds around a West Sixth Brewing Company IPA this week. As you probably guessed, I’m now a fan. It’s truly a well-crafted India pale ale, with all the hoppy goodness you’d expect and just enough malt characteristic for balance. I sensed a hint of citrus, with a minimum of sweetness (not a fan of the assertive sweetness found in some pale ales), and the beer’s mouth-feel was perfect, from my perspective. The creaminess of the body makes it drink lighter than the hoppiness would suggest, giving it a great combination of drinkability and flavor. Normally, I kind of worry that craft beer in a can is going to be compromised from a flavor standpoint, but that sure isn’t true in this case. In fact, I’d drink this from a can any day over the highly lauded Bell’s Two Hearted Ale from a bottle. But that’s just me. If you’re interested, West Sixth IPA got some pretty good marks over at BeerAdvocate.com. Oh, and I really like that cool West Sixth logo … ahem. Man, I’m shocked you hadn’t had this before. I’m a big fan as well. I’m about to do a post about craft cans, stay tuned. I’m shocked too. Haha. I have been meaning to visit the brewery and was going to wait until then. Finally decided to just buckle down and drink one. Glad I did!